We’ve all been there – in need of that one great idea and the brain failing to play ball. Some days, no matter how long I sit and think about a problem, that elusive solution won’t come into view. On those days, usually after I’ve spent a fair few hours berating myself for my lack of progress, I regroup and decide to do a brainstorming session. It’s a great way to ease a mental block and get some ideas flowing. Alone or in a group, conducting a brainstorming session at your usual desk(s) isn’t the best idea. You sit at your desk each and every day and it’s generally a place of mundanity rather than of inspiration. Have your brainstorming session take place in a different room where new patterns of thought are more likely to emerge. Make sure you (and your team) are relaxed and de-stressed during your brainstorming sessions. Stress can really hamper creative thinking. If you work in an office, try to create an informal environment for your team; consider bringing in snacks and turning on some music. Make sure that the room is well-lit. Include all the resources or tools you need at hand. Remember about refreshments to avoid people getting distracted by running to the kitchen. If you work alone, a walk around the block before sitting down to your brainstorming session can work wonders. You can create the perfect environment, but sometimes you need a bit of structure to prompt some new thoughts. Try and think about the opposite of what you’re trying to achieve. Or imagine there are no constraints in terms of budget or resources. Or come up with as many questions about your topic as you can and then set about answering them. There are more ideas here if you need a starting point in order to get going. Prepare the information for your team. Include just enough information to inspire them, but not too much – it can easily limit the creative potential of your team during a brainstorming session. Also, consider who you’re going to invite to the meeting. If you pick team members who are like-minded, you’re not going to get many creative ideas. That’s why you should aim at building a diverse group of people from different departments or disciplines – they’re bound to have different thinking styles. For the discussion to proceed smoothly, you should establish some ground rules at the beginning and stick to them throughout your brainstorming session. Remind your team that the session isn’t about competing for ideas, but coming up with a solution to a problem. Let them know whether they should raise their hand before they speak or interrupt someone – that’s how you ensure smooth communication. When you’ve had all the team members share their ideas, it’s time to start a group discussion. That’s how you allow your team to develop the ideas of other people and come up with new solutions. Encourage everyone to contribute to the discussion. Make sure to discourage any forms of criticism – the idea behind brainstorming is to boost creativity, and criticism doesn’t help to do that. Remember that your role is to support the team, so don’t share your ideas all the time. Guide the discussion by sticking to one idea at a time and refocusing your team when they become sidetracked. Arrange many breaks to help your team concentrate as well. To spark the interest of your team in the problem, use this smart brainstorming trick. Ask your team what is the opposite of what you want to achieve. For example, what is the worst web design? That kind of question will instantly engage your team because it will force them to consider the problem from an unusual angle. Often, one of the reasons behind a mental block is over-thinking. We doubt our ideas and this stymies the flow of one (maybe not so great) idea leading onto another (maybe much better) idea. Starting from a point where nothing is to be discounted is a great way to get the brain into gear again. Write down each and every new idea and you could be surprised at the different perspectives and trains of thought that follow. Whilst having an open-ended brainstorming session can be counter-productive, you don’t want to put yourself under too much time pressure when it comes to creative thinking. Not only do you want to remove the stress a time constraint can create, you also want to allow time for the to brain wander. Being bored can actually help you come up with some great ideas! Before your session, plan how you intend to collect the ideas you come up with. An old school whiteboard is tried and tested, but you should also consider the incredible selection of programs and apps designed to make the brainstorming process that bit easier. You can make your brainstorming ideas visual and engaging, create a mind map to share with colleagues or even conduct a brainstorming session remotely. 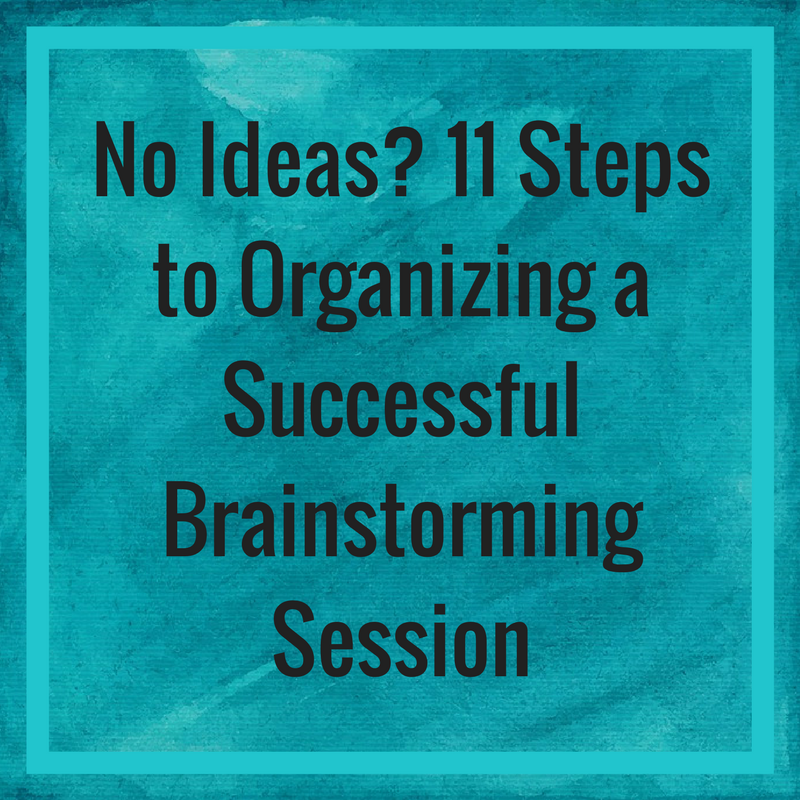 No brainstorming session is any real use unless you have a way of putting your ideas into action. Decide on your objectives before you start, and then make sure you’ve completed them before you draw the session to a close. Make sure you end your session knowing how you’re going to proceed. This could be further research into a selection of your ideas, implementation of one of them or plans for further brainstorming. With a little preparation and the right follow up, brainstorming can give a huge boost to your creativity. 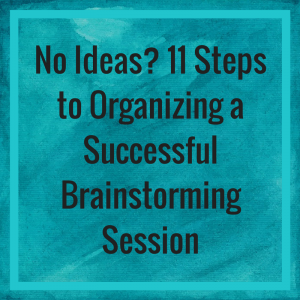 I hope your next brainstorming session sees you on your way to that next big idea! Anne Grobler is a business blogger who enjoys sharing her tips and suggestions for building a healthy work environment. With a background in marketing and communications and a huge love for writing, Anne is currently supporting OpenAgent, experts in the field of real estate. Next: Next post: Is your Facebook Group Dead?